Cabinetry was probably one of the most difficult selections we had to make. I recommend looking at the cabinetry in as many homes as possible. Take photos and make extensive notes. We found that custom cabinets were less expensive than furniture, and they become part of the cost of the home, which is financed. To the Ceiling and Beyond!!!! Consider making all of your shelving and cabinetry go as high as the ceiling. You can easily have up to 25% more storage space if your cabinetry and closet shelving go to the ceiling. One added bonus is that you won't have to figure out out to decorate plant shelves. We followed this plan in our home, and we have not run out of storage space yet. Emphasis on yet. We had clothes dressers custom built for our master closet and daughter's closet. This frees up the bedroom from bulky furniture. It also keeps all of your clothing in the closet. In the master closet, we used a unit that had both drawers and a cabinet with two shelves. The cabinet is a great place to store your wallet, keys, purse etc. at the end of the day. Many master closets include tri-fold full-length dressing mirrors. A bench seat is also useful for getting dressed. One great feature I have seen is a built-in ironing board in the master closet. Make sure that the walls are deep enough to hold the built-in ironing board if you really want one. You'll also want electricity there to plug in the iron. 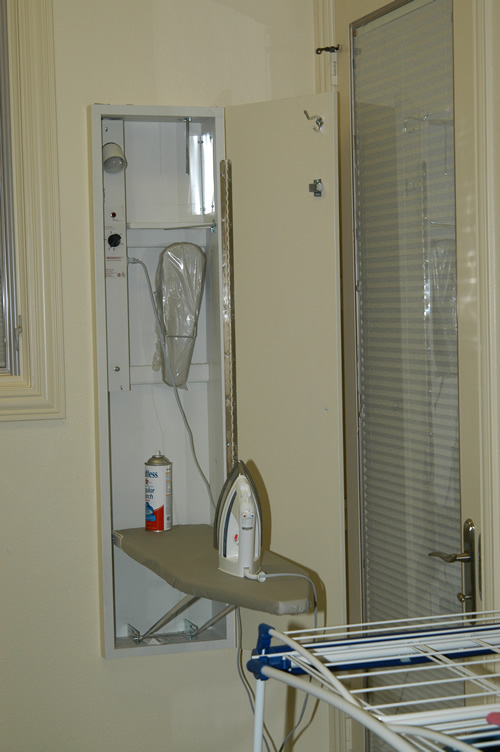 Many built-in ironing boards have a timed electrical outlet that automatically shuts off the power to your iron. All of our closets have shelving that goes to the ceiling. This is great for storing items not used often. It also greatly increases the storage space in your home. Most bathroom vanities have 30-inch high countertops. In our master bath, my countertop is 36 inches high and my wife's is 30 inches. If either of you washes your face every day, make sure the vanity is at a height where you can do so without getting drenched. Also make sure that the sink is not too deep in the counter for you for face washing. My wife also has a knee space that is about 24 inches high that she uses for a sit-down makeup counter. We prefer drawers over shelves in our bathroom vanity cabinets. Ask for different sizes so that you can have space for hair dryers, makeup bottles, etc. I like to have built-in medicine cabinets next to the vanity. We added an electrical outlet to each medicine cabinet for plugging in electric shavers and toothbrushes. A clothes hamper in your bathroom can be very convenient. Oftentimes, a clothes hamper is part of a full-height cabinet. You might like to eliminate the top half of the cabinet and leave wall space for a towel bar. To accomplish this, just give the clothes hamper a horizontal door on the front that flips toward you and down so that you can drop the clothes inside. Chains on each end of the door will prevent it from falling all the way open. To keep the clothes from falling out of your clothes hamper, make certain that you install magnetic cabinet hatches on the doors. You need to have your appliances chosen before designing your kitchen cabinets. For our kitchen, we have two single ovens, a warming drawer, microwave, cooktop, cabinet-depth refrigerator, and dishwasher. You will also need to know how large your kitchen sink will be. We chose a triple-bowl with a hot water dispenser. The cabinets in our kitchen are pretty standard. We chose to utilize more drawers than shelves in our lower cabinets. Some are quite large to accommodate pots and pans. Others are small for utensils or spices. We designed one large pull-out cabinet to hold two 13-gallon trash cans. Many different appliances today are designed to use cabinet fronts. We have a refrigerator, dishwasher, and ice maker with this option. We chose to have our upper cabinets go to the ceiling. This adds extra storage space that can be used for Christmas dishes or other specialty dishes that are not used often. It is amazing how much storage space this adds to your kitchen. It also eliminates the need to decorate and clean above kitchen cabinets. We also had an appliance garage built with a roll top. This is a great place for a toaster or coffee maker. Don't forget to install a double gang power outlet and a switched fluorescent light inside. Our pantry has adjustable shelves to handle different size containers. It has a 10 foot ceiling with shelves that go all the way up. Again, the higher shelves are great for appliances or dishes that are not used often. We also had one foot wide bookshelves built around the outside of the pantry door for displaying cookbooks. They go up both sides and across the top. The upper cabinets in our utility room do not have doors. My wife prefers them without doors for convenience sake. The upper shelves hold plant vases and other items that are not in constant use. We also have a built-in ironing board. Our laundry room has a freezer in it. The right-hand side of the freezer is against the wall. The left-hand side has cabinet trim to make it look nicer. This will limit us if we later decide to use a different freezer. The freezer we chose has been made by Sub-Zero in the same size for at least 25 years, so we felt safe in our choice. Above the freezer are cabinets. They hold the tennis shoe and sweater drying racks for our dryers. A mud room is just a small room next to the back entry of the house with a seating area, room for shoes down low, a coat rack, and shelving above. Our home has a mud room with all of the above built in to one cabinet. My home office has one entire wall of bookshelves — you guessed it — all the way to the ceiling. I prefer a free-standing desk; so mine is not built-in, but many people like built-in desks with bookshelves. The downside of a built-in desk is accessible computer equipment. Whatever you do, make sure that you pre-wire correctly for electricity, phone, and network connections. You can also have the cabinet-maker build you a small, round conference table that will have a 36-42 inch top. If they can't, an office furniture maker can.